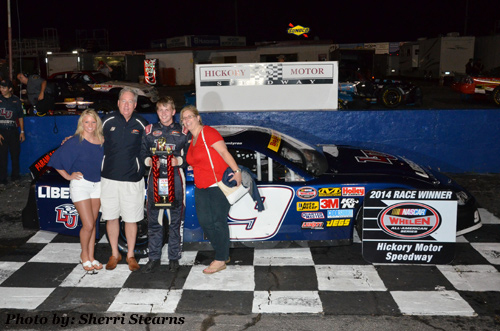 (Newton, NC - - Sept. 10, 2014) William Byron and Josh Berry enjoyed celebrations in Victory Lane following double-feature NASCAR Whelen All American Bojangles' Late Model wins during AquaVapor Cigarettes Twin Night at the Races presented by Gaston Rentals. Jeremy Pelfrey (No. 51 - Gold King Limited Late Model), Kevin Townsend (No. 3 - Street Stock) and Chase Pollard (No. 98 - 4 Cylinders) also made their way to Victory Lane during the rain-delayed event. William Byron (No. 9) earned the pole position for the first of two 50-lap NASCAR Whelen All American Bojangles' Late Model features. It didn't take long for caution to come out, when the No. 00 of Shane Lee, the No. 12 of Annabeth Barnes and the No. 44 of Dillon Bassett made contact on the first lap. As the field returned to green, Byron remained out front of the competition and picked up the win. Bassett patiently worked his way up to second, while the No. 88 of Josh Berry, No. 51 of Chris Bell and the No. 25 of Matt Piercy rounded out the top five. The No. 9 of William Byron started from the pole position for the second twin 50-lap Bojangles' Late Models feature. The No. 88 of Josh Berry, took over the lead on lap seven and held onto the top spot until taking the checkered flag with the No. 44 of Dillon Bassett, Byron, the No. 25 of Matt Piercy and No. 12 of Austin McDaniel in tow to finish second through fifth, respectively. The No. 51 of Jeremy Pelfrey led the field to green in the first of two Gold King Limited Late Model events. The caution flag was displayed for the first time as the field entered the first turn when the No. 21 of Roger Pitts made contact with the outside wall. Pelfrey went on to survive two additional caution periods within the first four laps to pick up the win. The No. 8 of Zachary Bruenger, No. 1 of Trent Barnes, Pitts and the No. 29 of Mitch Walker rounded out the top five. Jeremy Pelfrey (No. 51) started the second Gold King Limited Late Model race from the pole position before going on claim his second victory of the night. The event had multiple leaders until the No. 21 of Monty Cox had assumed the lead. Contact with the No. 19 of Kyle Moon took both Moon and Cox out of competition for the night. The No. 8 of Zachary Bruenger, No. 1 of Trent Barnes, No. 21 of Roger Pitts II and No. 29 of Mitch Walker finished second through fifth, respectively. The No. 10 of Kevin Townsend started from the pole position for the first of two Street Stock events. The first caution waved on lap two when the No. 1 of David Snyder spun and collected the No. 74 of Kim Smith. When the field returned to green, Townsend remained out front for the remainder of the 30-lap race and picked up the win. The No. 32 of Gary Ledbetter finished second, the No. 64 of Marshall Sutton came home third, the No. 2 of Larry Mosher was fourth and the No. 3 of Chase Pollard rounded out the top five. Kevin Townsend (No. 10) brought the field to the green flag for the second 30-lap Street Stock race. A battle between Townsend, Ledbetter and Sutton ensued during the early laps with the No. 64 of Marshall Sutton settling into second on lap 14. Sutton made a charge for the lead during the final laps, but Townsend prevailed to pick up the win leaving Sutton to settle for second and the No. 32 of Gary Ledbetter third. The No. 2 of Larry Mosher and No. 31 of Wayne Edwards completed the top five. The No. 98 of Chase Pollard earned the pole position for the 4-Cylinder race. Pollard led the competition around the track for 16 laps before the yellow flag waved when the No. 17 of Curtis Pardue came to a rest in turn two. As green-flag racing resumed, Pollard continued out front taking the checkered flag. The No. 28 of Dennis Trivette, No. 99 of Matthew Elledge, No. 00 of Eddie Gilbert and No. 6 of Rodney Trivette rounded out the top five. 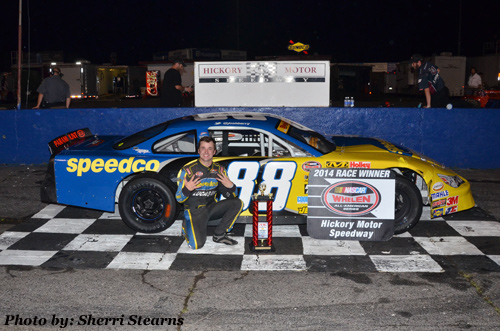 The 2014 NASCAR Whelen All-American Series season at Hickory Motor Speedway will be racing again on next Saturday, Sept. 13 during Cargo Transporters Championship Night at the Races presented by NAPA. The evening will feature appearances by the Gold King Limited Late Models, Street Stocks, Super Trucks, the WrenchRags Renegades, 4-Cylinders and the final round of the Paramount KIA 'Big 10' Chase for the Championship with a 100-lap event for the NASCAR Whelen All American Series Bojangles' Late Models. followed by a Huge Championship Fireworks Show. Grandstands open at 5 p.m., with qualifying immediately following. An On-Track Autograph Session is scheduled to begin at 6, with feature racing action taking place at 7. Tickets are just $11 for adults, $9 for seniors and teens, with children 12 and under free. For more information about upcoming events and Hickory Motor Speedway visit, www.hickorymotorspeedway.com or like us on Facebook (www.facebook.com/hickoryspeedwayfans) and follow us on Twitter (www.twitter.com/hickoryspeedway).